Last year my son Michael and I climbed a number of local mountains. One of those climbs was the walk to the top of Bluff Knoll, the highest point in the southern half of Western Australia. To the east of Bluff Knoll lies a mountainous wilderness known colloquially as "the ridge walk". Requiring serious bush-walking, navigation and climbing skills it is, by all accounts, a magnificently hellish place to experience. It's not near the top of the list, however. 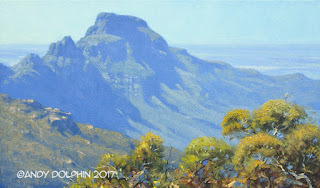 For now, I have to console myself with photos of the region, taken from the ground or from Bluff Knoll. 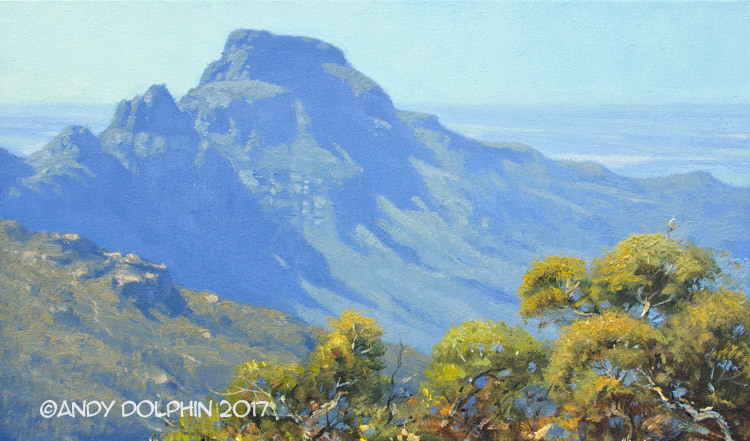 This painting, showing the view to Ellen Peak at the eastern end of the ridge, is based on mid-afternoon photos I took from the top of Bluff Knoll last September. I hope to take another look at this same scene once the cooler weather settles in later this year. Early morning or late evening should be spectacular. You have some real creative juices flowing there, the painting and the description of the place feels so vivid. That takes some talent. All the best to you for future!